I used a new specimen holding setup for the honeybee legs HERE. Holding the honeybee is a BioQuip 6188 microscope stage. That stage is epoxied to a piece of thin plate steel. 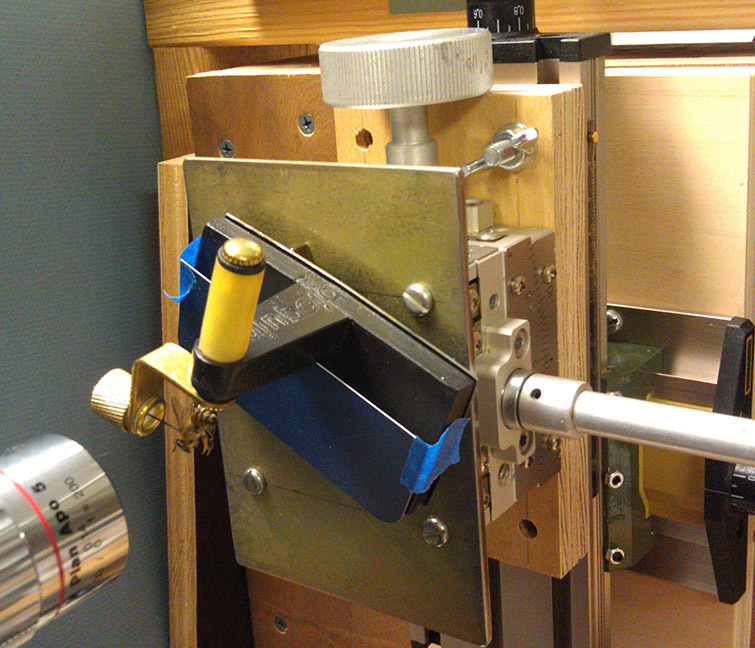 A more substantial steel plate is screwed to the top of the goniometer stack. The two steel plates are fastened together by three small cubical magnets, one of which can be seen peeking out at the top edge of the BioQuip stage. The magnetic fastening allows the BioQuip stage to be slid around pretty easily, to provide rough positioning and rotation around the optical axis. The two rotary components of the BioQuip stage provide coarse rotation around most of a full circle. The Proxxon table provides fine control of lateral positions, and the goniometers do the same for orientation if needed. Background for the honeybee shot was provided by a paint chip from the local hardware store, angled away from the brightest part of the light tent to darken it somewhat. By the way, I was not delighted by the build quality of the BioQuip stage as I received it. The movements were rough. But it cleaned up OK with a little sanding and lubing, and now I'm pretty happy with it.